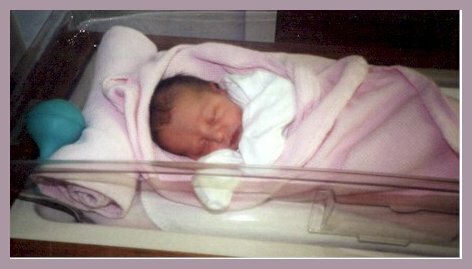 Megan Rose Miles was born on Oct. 28, 1997. She had a full head of black hair, a cute little smashed nose and big blue eyes. 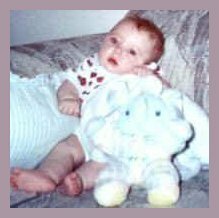 She scored high on her Apgar tests. She was a beautiful, perfect, healthy baby. We were so excited to have this precious child in our lives. Megan seemed to be a normal, healthy baby for the first few months. She was starting to hold her bottle, she could hold up her head, smiled and laughed. She was eating cereal and fruit. Grandma noticed she wasn’t doing what most babies did at that age, but we figured she was just developing at her own pace. 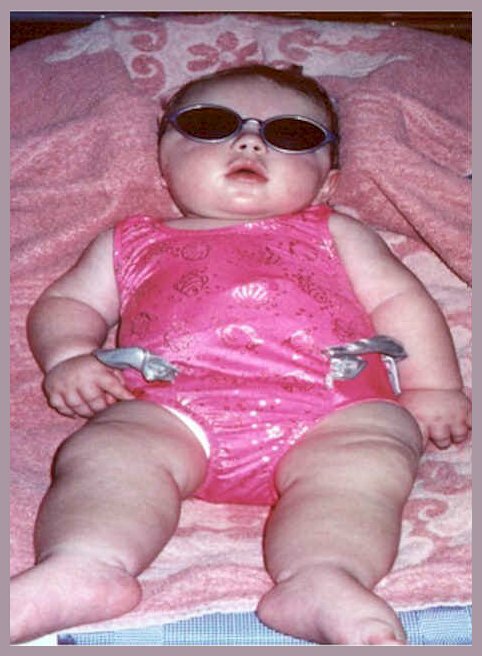 At about 4 months she started being really irritable and stiff. She would cry for 20 hours at a time. The doctors said she had an ear infection. We put her on antibiotics and she didn’t seem to quit her crying fits. We took her back to the doctor and she said her ears looked fine and didn’t really do anything else but send us home. In the mean time we tried changing her formula (thinking she might be lactose intolerable), we even stayed with James’s mom for a while thinking maybe it was something in our house that was making her irritable. She continued her crying for 3-4 weeks longer. We couldn’t change her diaper, change her positions while holding her, and we didn’t dare put her on her tummy. We changed doctors, still nothing. 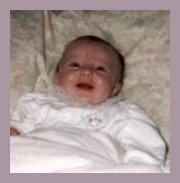 We couldn’t understand what was going on with our beautiful little girl who had been smiling and laughing just a few weeks earlier. ne Saturday afternoon Megan had been crying for hours again and I got fed up. I took her into the ER and told the doctors I wanted some answers. A bunch of different doctors looked at her and of course couldn’t tell me anything. The doctor ended up sending us home with Chloral hydrate to put Megan to sleep and so we could get some rest too. The next day the doctor from the ER called and wanted us to come back in for some more tests. We eventually got told to go to Children’s Hospital in Denver. When we got there we had a team of doctors looking and poking at her. They took MRI’s, CAT scans, a spinal tap, and tons of blood tests. We were there for about 4 days and the doctor said that they had narrowed it down to four things it could be. They didn’t tell us what those four things were because they didn’t want to confuse us. They said they’d have to get more blood from her but this time it would have to be deep artery blood. They worked for two days to get enough blood for these four tests. Finally the doctor gave up and said that they had gotten enough blood for one test and he was going to send it in for the one he most likely thought it was. We were suppose to come back in two weeks for the results. We came back to Grand Junction and in the mean time we had a monthly check with our doctor. He told us they were testing for Krabbes and gave us a medical book explanation of the disease, which the only part we could understand was “don’t usually live past the age of one.” Our families immediately got on the Internet and started looking for information. They found CJ’s page and as soon as we read his story, we knew that’s what Megan had. 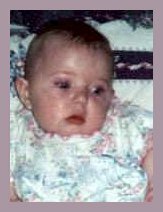 Two weeks later, on April 21 1998, it was confirmed that Megan had Krabbe disease and the doctors in Denver said she wouldn’t see her first birthday. They gave us no hope for her they told us to go home and make her as comfortable as possible. She started therapy, both physical and occupational. She got that twice a week and we had a home health nurse come out twice a week. Her therapy was interesting at first. She would scream and cry the entire time and of course make her therapist feel like crap. It was very hard for us to sit and let them do their thing but we did. We knew that the therapy would eventually help and make her easier to handle. She was unable to keep anything down in her tummy and she was losing weight. One other issue that came up was, she lost her gag reflex. Which meant that if her formula was to thin that she would choke on it. We tried to make it a little bit thicker with her cereal and fruit mixed in with it. That worked for a while but eventually we did have to get a feeding tube at the end of May. After she got her feeding tube she got a suction machine also. The first year was hell because we had to deal with our own emotions along with our sick baby. I was working at the time and she was staying with her Grandma Shirley while I worked. After doing this for a few months I couldn’t handle it any more. I was physically ill when I went to work because I was constantly worrying about her. In July I decided to quit so that I could spend time with Megan. I figured if she was only going to be here for a short while I was going to make sure that she knew her mommy and that I knew what was going on with her. In October she celebrated her 1st Birthday! We had a huge party with about 30 people in our small two-bedroom apartment. She was our princess for the night. She had a beautiful dress on that her great Aunt Emily had made her. We even bought her a little tiara to wear during her party. We were ecstatic that she had made it to her first birthday. We made her a cake with the Rugrats on it. 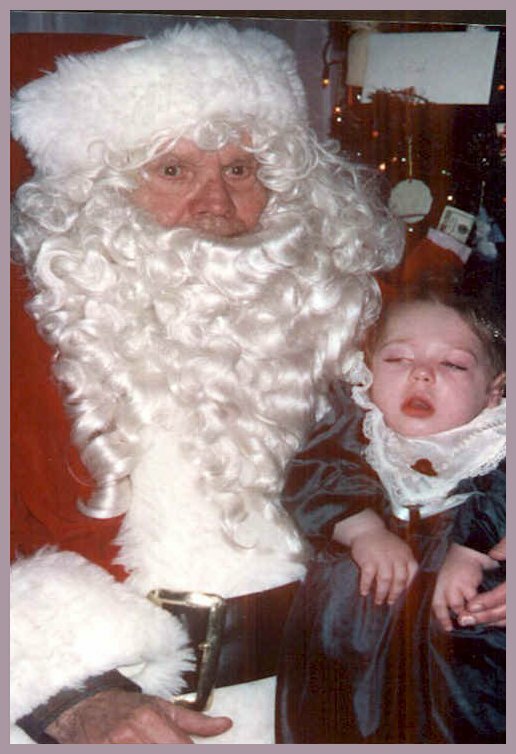 She was awake for most of her party but after the presents were open, she went to sleep. The same with Christmas that year also. Since her first birthday she has been treated for pneumonia a couple of times. She’s gotten over it both times with early detection and antibiotics. She got a kid cart to help us get her around. 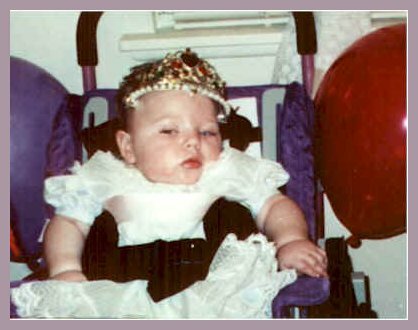 Megan celebrated her 2nd birthday in 1999. Again a big party, not as big as her first one but still lots of people there whom she loves and has gotten to know over the last few years. 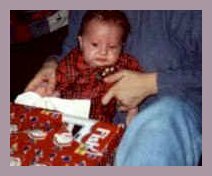 In December of 1999 we decided to go to Kansas for Christmas since all of my family lives there and Megan hadn’t spent a Christmas with them. Everything went well while we were there. She got to see all her cousins. Some of my Aunt and Uncles hadn’t even got to meet her yet so she got to meet them at her Great Grandma’s house. She did her usual like at other big events, (went to sleep as soon as presents were open). On Monday we headed back to Colorado and she seemed like she was getting sick before we even left Ks. I don’t know how to really describe it but I could just tell she wasn’t feeling good. We got to Denver and she still hadn’t really coughed or anything the whole trip, which is unusual for her. Instead she just let the secretions drool out her mouth. We thought about taking her to the hospital there but decided she would probably be fine ‘til we got home. We stopped in Silverthorne to feed Megan and to do a little shopping. I went to get her out of the car and I almost dropped to the ground. 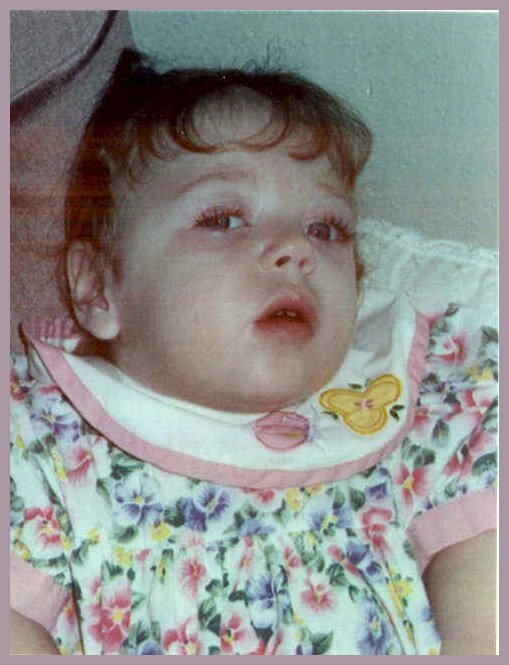 She was gray from head to toe, unresponsive and had shallow breathing. I thought ok, we’ll give her a breathing treatment and feed her and that should help. We gave her a neb treatment; it seemed to help a little but not much. I decided I’d try to feed her. When I plugged her feeding tube into her all this curdled milk started coming out, apparently from her earlier feeding. We got all that out and tried to feed her a little bit but it just kept coming up through her tube. I decided to call our Hospice here in Grand Jct. to ask for advice. They told us it was our call whatever we thought was best to do. Either take her to the hospital there or try and come home and let be what would be. James decided we should try and get her back here where a doctor would know her and the disease and so forth. We got to Glenwood Springs, which is about 1.5 hrs from home and we pulled over. Again we talked about if we should take her to the hospital, she was still the same as before except she was breathing even worse. We again decided to get home. I held her in my arms and breathed into her mouth several times, it seemed to help a little bit but she still wasn’t reacting to anything. 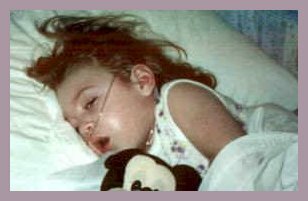 We got back to town and went straight to the doctors’ office where they hooked her up to an oxygen saturation machine and it showed that her saturation levels were 67(they are normally 95 or better). They immediately put her on oxygen and she started coming back to us. He checked her out and told us to keep the oxygen on & go home and try to give her pedialyte to get some liquids into her. If she didn’t seem to get any better or didn’t keep the liquids down he could admit her and put IV liquids through. This was about 5-6 p.m. and she hadn’t ate since 10am. We came home and tried that and again she didn’t keep it down. We kept trying until about 9:00 that night. We took her temp and it was 101 and we decided we better get her into the hospital. We got her in there and told them what was going on and they started throwing her clothes off, and throwing her body around like it was a rag doll. We got very upset and didn’t understand why they were doing all this ER stuff when all she needed was an IV. Later after she was admitted we found out that her temperature was 107 when we got her in there and they were concerned about getting that down. It ended up that she had gotten the flu sometime in Ks and it had turned into pneumonia. The air is so thing up in the mountains that she couldn’t breathe and so that was the reasoning for her whole ordeal. She was in the hospital for a week and she got to come home on New Years Eve. The first 5 months after that incident she didn’t seem very well. She was constantly on antibiotics and nothing seemed to really help. She finally had to get IV antibiotics at home for ten days and that seemed to finally get rid of what ever was in her body. She is one very strong little girl. We knew raising a child would be difficult but we never expected anything like this. We cherish everyday we get to spend with her and hope we’ll have many more days to come. We just got back from the Medical symposium in NY. Megan did very well with her Nana and Grandma while we were gone. Since we got back she got sick again and is on antibiotics again. They seem to be working already and she's on her way back to good health. To Continue Reading Megan's story, click here. You can e-mail Megan's parents at jlmiles2001@yahoo.com.